Republished May 4, 2016, 4:30 p.m., to correct an error in the text. 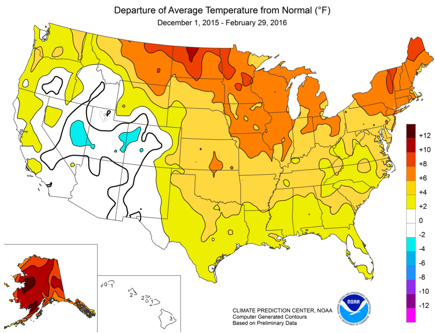 Above-normal temperatures during the 2015-16 winter were a key factor in lowering heating demand and winter fuel expenditures. Compared with the 2014-15 winter, propane and heating oil demand decreased by 16% and 18%, respectively, and residential electricity demand decreased by 6%. The 2015-16 winter season (October through March) was 15% warmer than last winter, driven in part by one of the strongest El Niño events in decades. In addition to record-high winter temperatures reducing the demand for space heating, abundant natural gas supplies and low crude oil prices were major factors in lowering heating fuel prices. 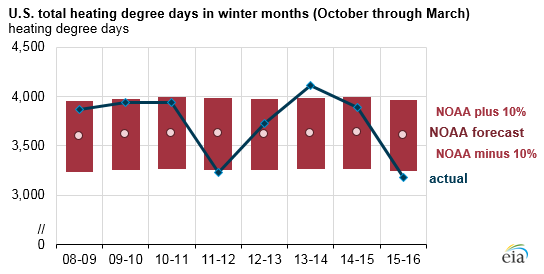 Warm winter temperatures reduced the overall number of U.S. heating degree days (HDD), a temperature-based measurement reflecting the heating needs of buildings in a location. 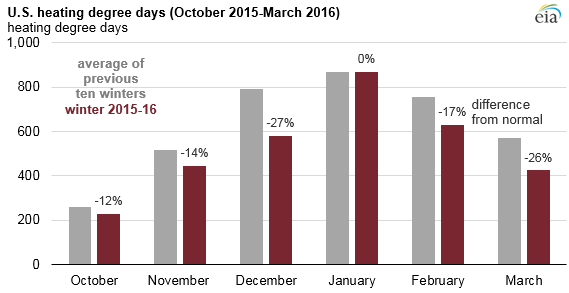 At the national level, the number of heating degree days was 18% lower than the previous winter season and 12% lower than the National Oceanic and Atmospheric Administration's forecast in September 2015.